Federal and Hawaii laws require employers to post notices informing employees of their rights and protections while performing work for their employers. 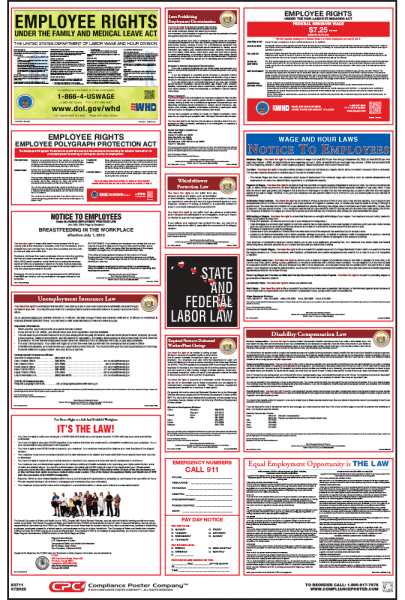 Hawaii Labor Law Posters contain each of the state and federal mandatory labor law notices that must be posted in the workplace. (HB 213) Siblings have been added to the list of family members for whom employees may take family leave in order to provide care. (HB 1114) The penalties for violations of Hawaii’s Occupational Health and Safety Law have increased to conform with the federal Occupational Safety and Health Administration’s (OSHA) penalty structure. (HAR Chapter 12-52.1) HIOSH standards have been amended requiring an employer to report to HIOSH any workplace incident that results in an employee fatality, inpatient hospitalization, amputation, loss of an eye, or property damage in excess of $25,000.